In this important and timely volume, Dennis W. Johnson has assembled an outstanding team of political science and political journalism scholars and veteran campaign consultants to examine the most exciting presidential campaign in memory. 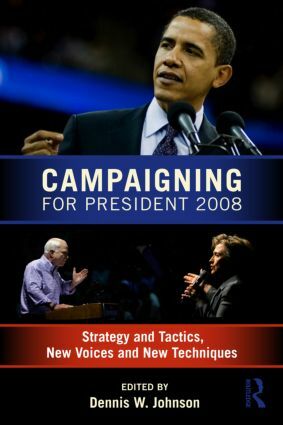 Campaigning for President 2008 focuses on the strategies and tactics used by the presidential candidates, the new voices and new techniques used to generate support and persuade voters, and the activities of outside interests trying to influence the outcome. The experienced team of contributors explain how Obama triumphed in the primaries and how Clinton fell short; and how McCain came back from the politically dead. In this fascinating account, the authors examine the brilliant moves, the mistakes and miscalculations, and the tug of forces over which neither campaign had control. An Election Like No Other?